Bees make honey but men make mead – the latter being the more remarkable. Mead is extraordinarily simple to make and fairly idiot proof as I myself have proven. 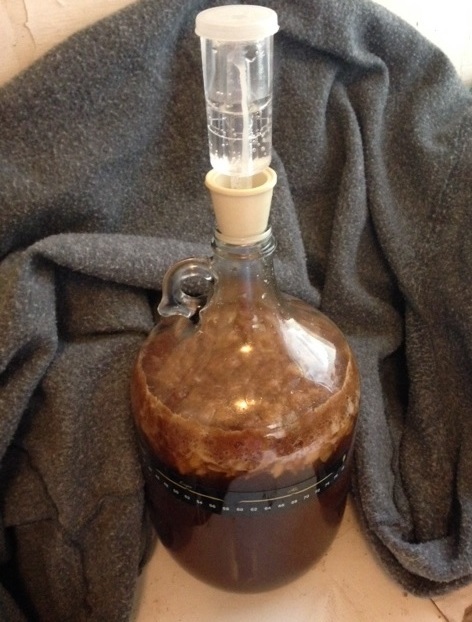 I keep my mead in a warm area for the fermentation and cover it with a towel to keep it in the dark. After wracking it, I move it to an area near the A/C and store it at about 68͒. I know I should keep it at around 58͒ but I don’t have that kind of setup yet. Now my first batch is nearly two years old. We tasted it last Christmas and it was very strong and dry. The second batch is a little sweeter but still dry. When I racked it, I added a half of cup of honey to one of the bottles to back sweeten it. That may have been too much. To make sure it didn’t begin fermentation again, I placed a rubber glove on the bottle over night. After 24 hours (and no sign of gas build up) I put a cap on it. I created a third batch this past weekend and used the “Sweet” recipe but I also added a cup of pears. When my wife and I were in Ireland we tried Bunratty Mead at the Bunratty Castle. That mead was infused with pears and was amazing. It wasn’t too sweet and the pear flavor added a soft layer of fruitiness. I can only hope my mead comes out even half as good. Only time will tell.